When stein collectors get together and talk shop, the subject may eventually get around to the artists who designed the steins and the decorations on them. Names like Heinrich Schlitt, Ludwig Hohlwein, Otto Hupp and Richard Riemerschmid are mentioned frequently. One name, however, that I believe is overlooked, is that of Franz Ringer. Franz Ringer was one of the most popular arts and crafts designers of his time in Munich, designing everything from building facades, interiors of rooms and taverns, furniture, lighting fixtures and much more. He created wooden cutout figures for May poles, sun dials, toys, book illustrations and postcards. And to top it off, he was one of the most prolific designers of beer steins! He did not design just the decoration, but in many cases the whole stein: Body shape, pewter and inlay, as well as the body decoration. His stein schemes were not executed just in stoneware, but also in glass and pewter. The size of these steins range at least from .05 (1/20) liter to 4.1 liters. He was one of very few artists able to cross over the line of patterns and styles of the "historic" and "Jugendstil" periods. Not only did he design in both styles, but he often combined the two. We have seen steins with Jugendstil (art nouveau) body design, but the figures on the stein are dressed in Biedermeier era clothing. Ringer was also one of just a few artists who designed character steins as well as the traditional type. Franz Ringer was born in October of 1865, the son and grandson of master carpenters. He started his apprenticeship in carpentry at a very young age, in Munich; these acquired skills served him well throughout his entire life. As stated before, Ringer used many media to project his talents. Many of his non-stein designs (building facades, furniture, etc.) can still be seen throughout Bavaria, but mostly in the area around Munich. At the age of 20, Ringer went on an extended journey through the Tyrol and Switzerland. Not much is known of what he did during these years of travel, but when he returned to Munich he began studying with Professor Josef v. Kramer. Soon the urge to travel; again took Ringer north to the city of Aachen. In Aachen, Ringer was a student of Professor Karl Kraus of the Polytechnic Institute. While in northern Germany, Ringer developed a great liking for the Netherlanders and depicted them often in his drawings and designs. Ringer then returned to Munich and spent the next 10 years with his mentor - Professor Kramer - who probably had the greatest influence on him. His oldest independent works are from this period (1892-1894); they are small plaster of Paris relief scenes of everyday people. Franz Ringer's style on beer steins is very homogeneous. Also, he is able to say a great deal and get a whole message across without complicated artwork. He invented his own "people" and made up most of the rhymes which accompanied the scenes. Ringer had a very unique style when he would draw hands. The fingers were always overly long and thin and the middle fingers were close together, with the thumb and little finger far apart. In 138 examples that we have observed, 135 of the hands follow that pattern. That works out to 98% of the time. In the three cases in which the pattern does not follow, the change could easily have come about due to the painting while in production. Ringer designed steins for many of the stoneware manufacturers in Germany, starting just after the turn of the century. Some of the companies Ringer's designs appear on are Villeroy & Boch, Reinhold Merkelbach, Merkelbach & Wick, Marzi & Remy, Albert Jacob Thewalt and perhaps others; also the finishing-enhancement factories of Martin Pauson, Reinemann and Lichtinger, all in Munich. The earliest stein of his that we have found was produced in 1903. It is a commemorative piece for an engineers' convention. It depicts a Bavarian girl in costume, representing the city of Munich; she is greeting a man, possibly an engineer, with his occupation's tools in a side pouch. It has a relieve lid with the Hofbrau logo in the middle and an embossed dedication (translated): "44th Grand Assembly of the Society of German Engineers - Munich 1903". The stein was distributed by Th. Schmid Porzellan und Glasmalerei in Munich. There are no manufacturer's marks anywhere on the stein, so it's origin is unknown. The first series of steins by Franz Ringer to go into full production was produced by Villeroy & Boch in 1905. These steins appear in the August 1905 supplemental catalogue, also the July 1908 price list. There is a total of 17 different mold numbers. Because some of the steins came in two sizes, however, there were 23 different molds. Ringer's designs soon were much appreciated and were sought after by groups holding conventions and festivals. He won critical acclaim and official sanction (Offizieller Festkrug) for the stein created for the 15th Deutsches Bundesschiessen (German Shooting Festival) in Munich in 1906. In addition to shooting festivals, he also designed steins for the 100th anniversary of the Oktoberfest (1910), the German Turnfests (athletic festivals) of 1908 and 1913, a Song Festival in 1912, a Master Brewer's Convention in 1909, weddings, brewery and hunting events and just those made for everyday life. Like many great artists, Franz Ringer died much too young. He succumbed to cancer in December 1917, in his best years; he was only 52. His death date is often confused with that of his only son, who serving in the Bavarian Leib Regiment (Body Guard), fell in the last year of World War I, in 1918, and is buried in Valenciennes France. "In remembrance of Franz Ringer, who died in his prime of cancer. Ringer was a painter and sculptor and was very much involved in arts and crafts. His or8iginal designs are found on hundreds of Munich beer steins, target discs and delightful figurines, small sculptures full of humor and good cheer. He was a great Festival organizer, a decorator for Fasching (carnival) and Salvator time, and was able to give sharp-tongued talks, all in fun, in order to get some festivity off to a cheerful start." "Franz Ringer, still unforgotten, in this City, would have been 70 years old on this day. His widow has decorated his grave with a multitude of flowers. Ringer is especially well known as an arts and crafts designer: his original, mostly in Biedermeier style, figurines on glasses for everyday use (including beer steins), or designs executed in wood, were very much admired - and are being imitated again at this time. He designed the Schaffler (coopers) dancers of the Glockenspiel, together with the sculptor Frey, as well as many humorous characters of old-time Munich in the Ratskeller..."
Plaster of Paris tablet, from Ringer's earliest independent works, 1892-94. Typical example of the way Franz Ringer drew hands (see text). 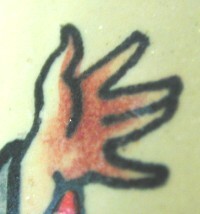 A close-up of Ringer's distinctive style in drawing hands. Three Shooting Festival steins by Ringer: Munich 1906, Munich 1906 (official festival stein) and Hamburg 1909. Merkelbach & Wick 1-Liter steins (note the Ringer-designed thumblifts). Villeroy & Boch Mettlach steins by Franz Ringer: Nos. 3188, 3193 and 3190. (A) = unsigned but attributed to Ringer; all other listed steins are signed "FR"
Three typical Franz Ringer designs. Munich Oktoberfest Anniversary steins designed by Franz Ringer. Steins and beakers by Franz Ringer for the 1908 Turnfest in Frankfurt. Our thanks to the following for sharing information with us: Dr. Therese Thomas, Beatrice Adler, Lotti Lopez and Robert D. Wilson. "Kunst und Handwerk, Zeitschrift der Bayrischen Kunstgewerbevereins zu M�nchen", 1902-1903 and 1912-1913.